The Bed and Breakfast Club. Not that I saw the film, but I did buy the soundtrack to hear the one Townshend track. Every now and then I come across a site that makes mine look like pure, unadulterated dogcrap. The 80s Movies Rewind, I hate you. If you love movies from the ‘80s (or just some of them, like Krull or The Dark Crystal), you have to check this site out. (The link back there was your cue to visit it.) Anyway, back to my junky, Wordpad-authored site (“Proudly resisting the temptation to use any of the web design software I bought and promised myself I would learn since 2002”). I never saw the movie Playing For Keeps, but according to The 80s Movie Rewind (great site, you should visit it sometime) the theme is about a kid who inherits a broken-down house and turns it into a profitable hotel with the help of his friends. Apparently, some type of Russian folk dance with sharp tools ensues. One look at the album cover and I’m kicking myself that I missed it. 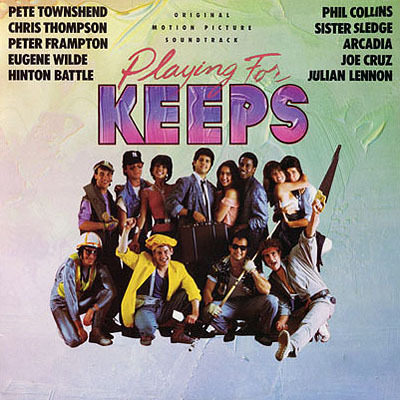 Probably because of The Breakfast Club (which I blame for most everything after 1985), Playing For Keeps got a far better soundtrack than it deserved. Pete Townshend, Peter Frampton, Arcadia (duran redux) and Sister Sledge all delivered “new” songs for the soundtrack. Townshend’s “Life To Life” is a terrific track that would have felt at home on White City; Phil Collins’ “We Said Hello, Goodbye” (previously available only on the CD versions of No Jacket Required) is another keeper. The rest of the record is a typical mixture of ‘80s music: new wave, funk, synth pop and the closer that ties it all together (in this case, a perfunctory live version of “Stand By Me” from Julian Lennon). I paid a buck for this to hear the tracks from Pete and Phil, so I’m happy. Since I haven’t seen a Pete Townshend compilation with “Life To Life” on it yet, you may be on the hook to do the same. Produced by Alan Brewer (A5/B2/B4), Jon Astley & Phil Chapman (A1), Phil Galdston & John Van Tongeren (A2), Peter Frampton (A3), Donald Robinson (A4), Phil Collins & Hugh Padgham (B1), Arcadia & Alex Sadkin (B3), Phil Ramone (B5); additional recording and remix by Stephen Hague (B1). Released on elpee, cassette and compact disc in 1986 in the US (Atlantic, 81678-1/4/2).